Summer fun is heating up in the Smokies! July offers events and attractions galore in our spectacular mountain setting. Here are just a few. The 4th starts early in the Great Smoky Mountains. At the stroke of midnight on Thursday July 3, the First Independence Day Parade in the Nation will get underway in downtown Gatlinburg. This year's parade pays tribute to America's armed forces, with colorful floats, stirring patriotic music, and world-class marching bands. Up to 100,000 people are expected, so be sure to arrive early to stake out a spot along the parade route. In future years, you can tell your grandkids how you ushered in the 4th while the rest of America was sleeping. Not up for midnight revels? Join us at 12 p.m. July 4 for the annual Gatlinburg River Raft Regatta. Or trek over to nearby Pigeon Forge for the 26th annual Patriot Festival at Patriot Park, featuring fun-filled family activities, live entertainment, and food vendors. Then wrap up the 4th that night with Gatlinburg's dazzling Fireworks Finale! Love country, bluegrass, and gospel? Every evening through July 30, downtown Gatlinburg hosts Smoky Mountain Tunes & Tales, an annual street performance festival featuring period-costumed musicians, storytellers, and artisans. Bring the whole family, stroll along the downtown Parkway, and enjoy a tuneful taste of the region's rich cultural heritage. The Great Smoky Mountains National Park is home to some of the nation's most beautiful waterfalls, and several are only minutes from Gatlinburg and Pigeon Forge. Want to get close to nature? Visit spectacular Grotto Falls, just off the Roaring Fork Motor Nature Trail. It's the only falls in the Park you can actually walk behind. Even in the mountains, July temperatures can soar. Fortunately the Smokies offer refreshing watersports galore – from tubing and rafting on the Pigeon River to exciting slides & rides at Dollywood Splash Country Water Park. Ready for the view of a lifetime? 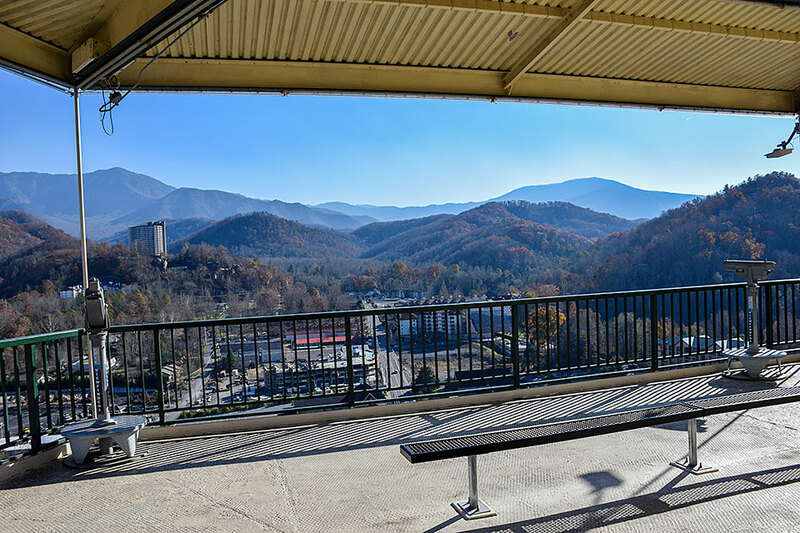 At the Gatlinburg Space Needle, you can ride one of two safe glass elevators over 400 feet up to the observation deck, where you'll enjoy an amazing 360-degree mountain vista. Use a free view finder to enhance the experience.